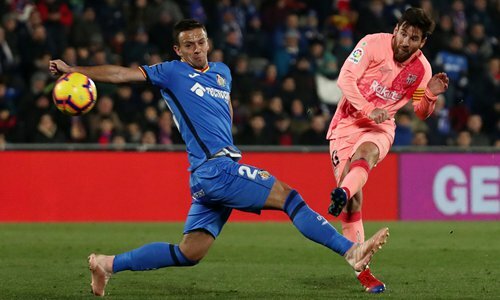 Messi, La Liga's top scorer this season, opened his account for 2019 with his 16th goal, giving Barca a 20th-­minute lead as he tucked the ball into the net from a tight angle after his initial shot was saved by the legs of Getafe keeper David Soria. Getafe's Mata, who had an earlier first-half strike ruled out at 0-0 for an apparent foul by teammate Angel Rodriguez, missed a big chance in the second half, ballooning the ball over the bar with Barca's goalkeeper Marc-Andre ter Stegen stranded. "These are the types of games that win you half the title, especially considering the other results before we played," said goal scorer Suarez. "The other team plays as well, and Getafe are very strong at home so it was very difficult. There were a lot of battles out there but it all stays on the pitch."